Montague Grammar is a collection of papers that discusses Richard Montague's work on the syntax and semantics of natural languages. The papers examine the applications of Montague's theory to problems of syntax and semantics, and compares Montague's approach to other theories of language. One paper describes the features in Montague's "The Proper Treatment of Quantification in Ordinary English" (PTQ), namely, the grammatical categories and lexicon, the rules most similar to CF-rules, and the treatment of quantification. Another paper presents mechanisms to Montague's grammatical framework which will allow a variety of English constructions—especially those involving sentence embedding. The paper discusses syntactic rules, such as noun phrases, verb phrases, subject-predicate sentences, variable binding, abstracts, verbs taking infinitive complements, the copula, participles. One paper describes a fragment of English that is a variation and extension of the fragment presented in Montague. It also analyses adjectival phrases, three-place and other kinds of verbs, the passive voice, reflexive pronouns, and sentences using the dummy subject "it." Another paper proposes rules, syntactics, and semantics for use in nonrestrictive clauses in a Montague grammar. One paper analyzes factives, their semantic and syntactic properties using the work of Kiparsky and Kiparsky (1971). 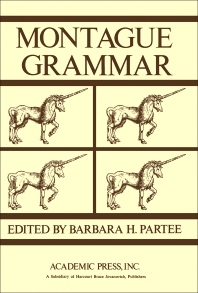 Montague's "Universal Grammar" (UG) invokes expositions of Montague syntax, Cooper syntax, theorems on conversion process, semantic interpretation, semantic equivalence of the two systems, and interpretive semantics. The collection is intended for readers of Montague, as well as for linguists, philosophers, and students of language.